This article was written for the Statesman Journal and published October 2014. It is reproduced here for reference purposes. In 1844 at the Methodist mission outpost called Wascopam an incident occurred that demonstrated the extraordinary perseverance of Methodist missionary Elvira Johnson Perkins. The young son of a local Native American leader was struck down by a fatal disease. The grief-stricken father insisted that the boy’s friend and inseparable companion, another Native American child captured in a raid on a neighboring tribe, be buried with him so that he would not be alone on his journey to the spirit world. Both boys were taken to the tribe’s burial tomb located on a long rock in the center of the Columbia River. The living companion was tied as closely as possible to his dead companion and sealed within the tomb. Elvira and her husband Reverend Henry Perkins received news of the situation late at night and had no choice but to wait until daylight before attempting the boy’s rescue. After a sleepless night, the missionary couple fought the river current for three miles, reaching the rock just after sunrise. Reverend Perkins forced open the tomb and the couple waited anxiously for some of the incredible stench of death to escape. Then they entered to search for the boy and found him unconscious and scarcely breathing. After being carried out into the fresh air the boy slowly began to regain his senses and when fully conscious he threw his arms around Mrs. Perkins and covered her with kisses. Her tears fell upon his brow as she held him in her arms, his head pressed against her cheek. They took him home and gave him the name Ransom after they had compensated the Native American leader for his loss. In her own poetic style, Elvira captured the events of the Native American boy’s rescue as well as other historic events experienced during her mission to the Oregon Territory. Elvira Johnson and her future husband Henry Kirke White Perkins were Methodist missionaries from the state of Maine. Both educated at the Maine Wesleyan Seminary in Kent’s Hill, Elvira was the first to answer the call of the Methodist Missionary Society for volunteers to join what became known as the First Reinforcement to the Oregon Mission. Traveling with missionary companion Anna Maria Pittman, the future Mrs. Jason Lee, both young ladies spent many evenings on deck singing the songs of Zion. This attracted the attention of their fellow-passengers and led one gentleman to remark to them that their voices were “enough to convert the heart of an Infidel.” The party traveled by way of Boston, South America and the Sandwich Islands (Hawaii) before arriving in the Pacific Northwest in May 1837. Henry followed, arriving four months later in September. Elvira’s job at the Willamette Mission was to teach between twenty and thirty Native American children in the log house which served as headquarters for the missionaries. The room was un-partitioned and her pupils were often distracted by the smells and sounds of cooking which took place on an open fireplace next to where they sat. Henry, no stranger to carpentry, quickly solved this problem by building the needed partition, creating a school room. It was a labor of love meant to direct Elvira’s thoughts toward the subject of marriage. It must have worked, along with countless other acts, for they were married November 21, 1837 at the Willamette Mission. 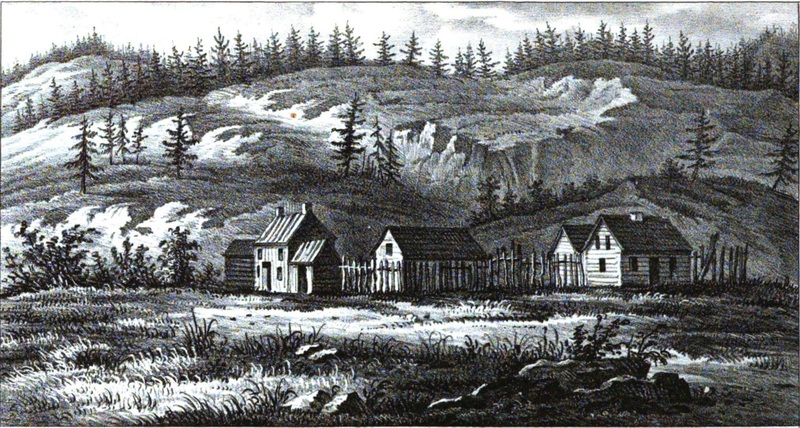 The following spring Reverend Jason Lee decided that the Perkins could be used most effectively to establish a new mission up the Columbia River near the present-day city of The Dalles, Oregon. It would be named Wascopam. This mission would prove invaluable in the coming years as an important stopover spot for travelers on the Oregon Trail, many of whom arrived needing rest, medical attention, food and supplies in order to continue their journey. This along with providing for the physical and spiritual needs of the Native Americans was a daunting task, but one at which the Perkins excelled for nearly six years. By the fall of 1844, disillusioned with the Methodist Missionary Board’s decision to replace Jason Lee with Reverend George Gary and the cost-cutting decisions to close down schools and sell mission property, the Perkins decided to return to the more civilized life of their New England roots. They initially settled in Maine with extended family members while Reverend Perkins preached in local congregations. Three years later in 1848, when the life of a settled clergyman no longer suited Henry’s health nor inclination, the family moved to the Boston area. Dependent on wealthy benefactors, Reverend Perkins labored independently as a street preacher on the Boston Commons until his death in 1884. Elvira passed away in 1896, after which a group of friends published a collection of her poems in a book called “Harp of the Willows”. This book including the poem about the rescue of the Native American boy quoted above, can now be found on Google Books thanks to the work of Kira Kinney, former teen interpreter and volunteer of the Willamette Heritage Center. This entry was posted in History Tidbits, People and tagged Anna Maria Pittman, Boston, Elvira Johnaon, Elvira Perkins, First Reinforcement, Harp of the Willows, Kent's Hill, Maine Wesleyan Seminary, Methodist Mission, Native American boy, Oregon Trail, Rev. George Gary, Rev. Henry Perkins, Rev. Jason Lee, Wascopam, Willamette Mission. Bookmark the permalink.